I had dinner at Maison Blanche last evening, a delightful restaurant on top of the Théâtre des Champs Elysée where you can enjoy one of the most breathtaking views of Paris (yes I'm lucky!). 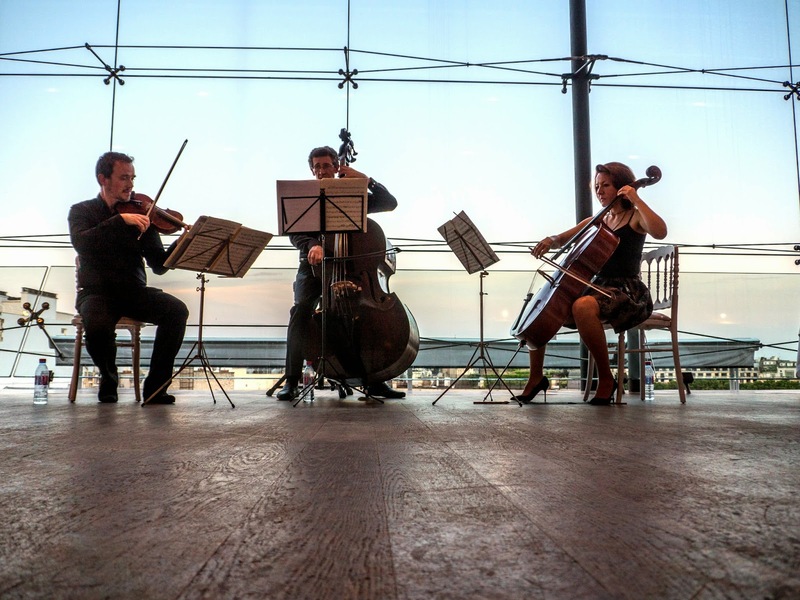 On top of the delicious food and stunning view, there was also a small trio playing music for the audience. A magical moment... I ended up talking to them and it turns out they are really nice. Let me introduce you to Jacques Bonvallet (violin), Eric Lancelot (bass) Cécile De Hann (cello). It sounds like a very special dining experience. You frame these musicians beautifully. I'm sure I'd enjoy the restaurant. I had no idea there was a restaurant like this on top. Just as well, I'm sure I couldn't afford it. But I'm glad to a friend to bring it to me virtually. Thanks. That sounds both delicious and lovely! Thanks for sharing! Yes the restaurant is really fantastic and... the staff is exceptionally nice, which is rare for a fancy Paris restaurant. wonderful photo! And view! And sounds like an excellent place for dinner.